Approx. 6 x 10 x 10 ft. 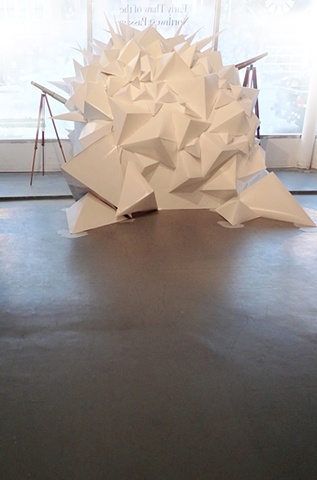 Upon entering the gallery, the viewer finds themselves outside an ice cave constructed of meticulously folded origami forms. The installation is constructed mainly of origami 'icicles' of folded out of recycled/salvaged paper and lots of glue. The telescopes are handmade from cardboard and gold trim, and mounted on vintage tripods. The piece and floor were sprinkled with clear glitter, and the window/interior of the piece was concealed with spray snow, which was applied with triangular stencils. Pools of 'melting ice' were made of vellum and added at the corners.